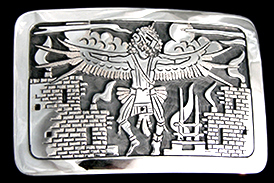 Hopi Silversmith/Goldsmith Roy Talahaftewa calls this gorgeous, cast/overlay buckle, "Spirit of the Cloud People", which incorporates prayer feathers, water, waves and cloud designs. The inlaid stones are: Morenci Turquoise, Kingman Turquoise, Pink Coral, Red Coral, Black Jade and Lapis. This piece measures 2 3/8 by 3 7/8 inches and will accommodate up to a 1 1/2 inch belt on the handmade finding. A heavy piece weighing in at 4.5 ounces. Roy's Waterbug hallmark is stamped neatly in the highly decorated and highly polished back of the buckle. A magnificent work-of-art! This highly polished buckle features an antelope bounding through the yucca plants on a cloudy day. 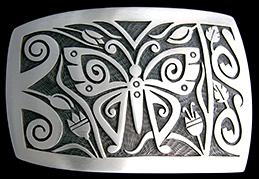 Beautifully created by Hopi Silversmith, Merle Namoki, it measures 1 3/8 by 2 1/2 inches and will accommodate up to a 1 inch belt. Merle's hallmark, the Rising Sun is stamped on the reverse side. This highly polished buckle featuring the design for trickling water was expertly crafted by Hopi Silversmith, Anderson Koinva. It measures 2 by 3 inches and will accommodate up to a 1 1/2 inch belt. The Rising Sun with a Snake is Anderson's hallmark, which he has proudly stamped on the reverse side. 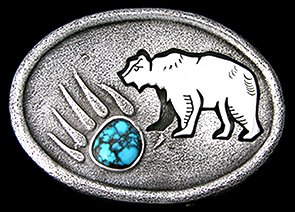 A cast buckle with an applique bear and a piece of Apache Blue turquoise acting as the pad of the bear paw, comes to us from Hopi Silversmith, Gerald Lomaventema. The piece measures 2 1/4 by 3 inches and will accommodate up to a 1 3/4 inch belt. Gerald's hallmark and clan symbol, a bear paw is stamped on the reverse side. 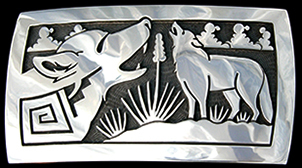 Howling wolves in the desert are featured here on this highly polished buckle that measures 1 7/8 by 3 1/2 by 1/8 inches and will accommodate up to a 1 3/8 inch belt. 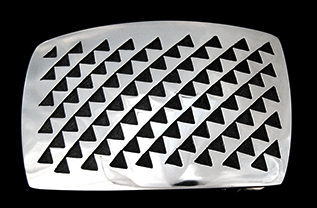 Expertly crafted by Silversmith, Ramon Dalangyawma, who uses heavy gauge silver in his work, it is noteworthy that the piece is 1/8 of an inch thick and weighs 3.5 ounces. 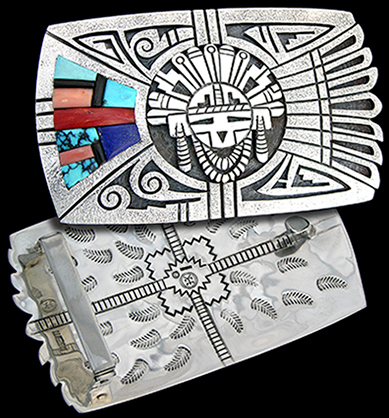 The details on this highly polished buckle by Hopi Silversmith, Eddison Wadsworth Soohafyah are exquisite! In the center of this piece is Tawa, the Sun Father, surrounded by an Eagle Dancer, a Red Tailed Hawk Dancer, the Long Hair Katsina and a member of the Two-horned Society holding a mature corn plant in one hand and a lightning bolt in the other. This magnificent work of art measures 3 by 3 1/2 inches and will accommodate up to a 1 3/4 inch belt. Eddison's hallmark, the Lakon Rain Mark, is etched on the reverse side. Bison stands serenely beneath a lightning storm, no doubt safe with the prayer feathers around his neck. Other symbols on this piece are corn, dragonfly, the world with its four directions and four races of people and a tadpole. Much needed rain is certain to come! 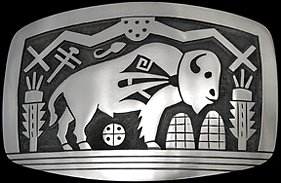 This satin finished Hopi buckle measures 2 by 3 inches and will accommodate up to a 1 3/8 inch belt. Beautifully crafted by Silversmith, Duane Tawahongva and carries his initials on the reverse side. This lovely satin-finished buckle from Trinidad Lucas features a butterfly surrounded by flowers, water symbols, clouds and tobacco leaves...symbols for the continuation of life. This buckle measures 3 inches long by 2 inches tapering down to 1 1/2 inches wide. It will accommodate up to a 1 1/2 inch belt. Trini's hallmark TLd inside a bear, her clan symbol is stamped on the reverse side. The texturing in the blackened areas give the impression of movement across this piece. Palakwayo, the Red-tailed Hawk katsina is one of the chief katsinas of Second Mesa, especially during initiation ceremonies. 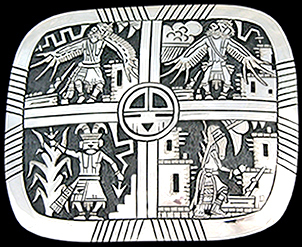 Palakwayo is featured here in a village scene on this highly polished Hopi buckle by Silversmith, Eddison Wadsworth Soohafyah. It measures 2 by 3 inches and will accommodate up to a 1 1/2 inch belt. Eddison's hallmark, Lakon Cloud symbol, which refers to the basket dance, is stamped on the reverse side. 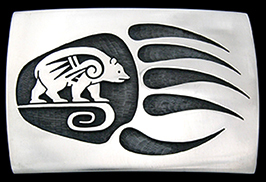 A Medicine Bear walks within his very large paw print on this highly polished buckle by Hopi Silversmith, Weaver Selina. The piece measures 2 by 3 inches and will accommodate up to a 1 1/2 inch belt. Weaver's Rising Sun hallmark is stamped on the reverse side. A dress belt-sized, highly polished buckle featuring a corn plant with rain symbols on either side. Beautifully crafted by Hopi Silversmith, Anderson Koinva. It measures 1 1/2 by 2 1/2 inches and will accommodate up to a 1 inch belt. Anderson's hallmark the Rising Sun with Snake is stamped on the reverse side. A night scene where the powerful bison is featured. At its heart, a storm cloud, with rain, cloud and lightning symbols surrounding it. 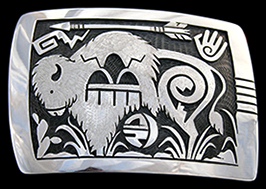 Although highly polished, Silversmith, Trinidad Lucas has etched the back of the bison giving the impression of fur. The buckle measures 2 by 3 inches and will accommodate up to a 1 1/2 inch belt. Silversmith, Trinidad Lucas created this piece and has her TLd hallmark inside of a bear, stamped on the reverse side. A highly polished dress belt sized buckle comes to us from Silversmith, Anderson Koinva. Two quail running from a storm are featured on this 1 1/2 by 2 1/2 inch piece. It will accommodate up to a 1 inch belt. Anderson's hallmark, the Rising Sun with a Snake is stamped on the reverse side. This satin finished buckle with etching on the rays of Tawa Sun Face, comes to us from Trinidad Lucas. Next to Tawa is a lovely prayer shrine very similar to those often seen at Hopi. It measures 1 1/2 by 2 inches and will accommodate up to a 1 inch belt. Trini's hallmark TLd inside of a bear, appears on the reverse side. Kwahu, the Eagle Katsina is featured on this beautiful, highly polished belt buckle by Silversmith, Eddison Wadsworth Soohafyah. Usually appearing in night ceremonies in March, this figure will move and cry in a most realistic manner. At the end of the dance, the people give him corn meal and pray to him that more eaglets will be born, so their feathers may be gathered and used in the making of prayer feathers for everyone carrying the prayers for health and prosperity. This piece measures 2 by 3 inches and will accommodate up to a 1 1/2 inch belt. Eddison's, Lakon Rain hallmark is stamped on the reverse side. 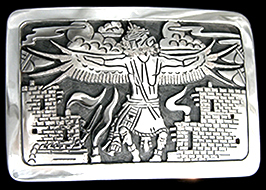 We are honored to represent the excellent craftsmanship of Hopi Silversmith, Weaver Selina. Featured here are several of Weaver's magnificent bolo ties. Each of them carrying his hallmark, the Rising Sun on the back. This highly polished piece features designs for cloud migration, rain and prayer feathers. The main piece measures 1 5/8 by 2 1/8 inches and is attached to a 41 inch (handmade tip to handmade tip), 10 ply black leather cord. This classic styled bolo features a wave pattern, measures 42 inches long(handmade tip to handmade tip). The satin-finished "pendant" measure 1 1/2 by 2 inches and is suspended on an 8 ply black cord. This expertly crafted Hopi bolo features a bear head with a prayer shrine appearing inside of a bear paw. It has hand made tips, carries a satin finish with the "bolo" measuring 1 1/2 by 2 inches. The entire piece tip to tip measures 42 inches and is attached by a 4 ply, black leather cord.